I wonder if maybe the croissant waxes and wanes in accordance with how peaceful he's feeling. Like, when he's at home watching "The Bachelor" sipping on some Courvoisier it's all small and limp, but when (as on this cover) he's gripping a hard-barreled revolver, charging down a runway intent on blowing the crap out of some bad guys, it's all puffed up and angry. We're still talking about his helmet, right? Right. Good. Because nothing says "Peace" like a lovingly delivered hand grenade by a man with a variable metal helmet and leather thigh boots who can't breathe, because that's a dove on his helment y'all, and doves mean love. You can look that stuff up. Oh god. It gets worse with every iteration. And is that thimble-like thing on his back supposed to make him fly? His back must be as invulnerable as Superman’s or else the first time he turns that thing on he’s going to fight… for his life at a burn ward. But then again… if I carry on a conversation with myself long enough maybe someone will chime in……. 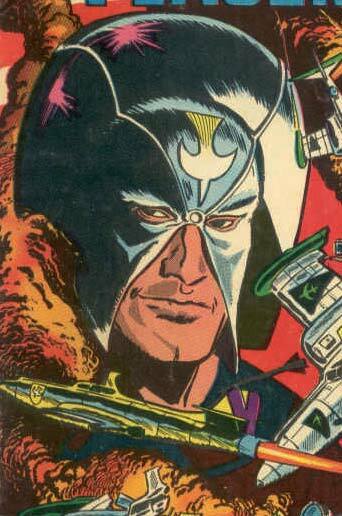 In the final picture he looks like he is at Mardi Gras with little bang bang guns. Rob Leifeld didn’t make this did he? 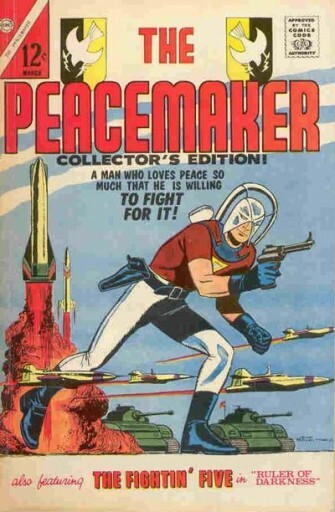 Fun True Fact: the Peacemaker was the model for the Comedian in Watchmen. I found the secret of his helmet!! I have my own theory about his helmet: he’s actually a Cyber-man! Alert Dr. Who! Why would he want the advice of people he’s killed? Obviously, they didn’t know anything that could save them from him. And why would they want to help their killer anyway? Also, would their commentary be in any way helpful, or would they just be rooting for him to fail? This is the Peacemaker redesign. I do agree that the helmet on the current Peacemaker is a questionable choice. 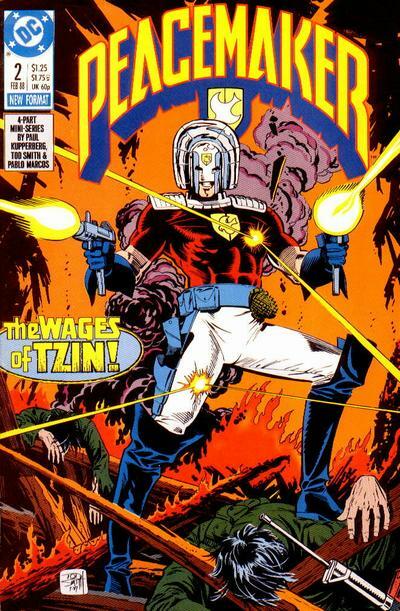 if I was the one writing the comic, I would have nerfed the helmet and went for a more sensible bandanna. Wasn’t there a Johnny Quest villain named Dr. Tzin? That might explain a lot. Well, no. Nothing can explain that helmet.